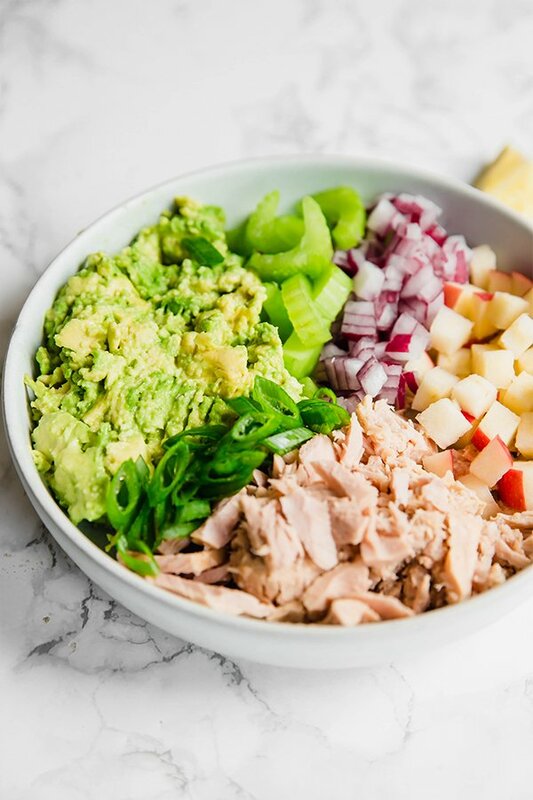 This avocado tuna salad is an easy and healthy lunch option! Whether you’re paleo, whole30, or AIP, this tuna salad will be perfect for you. When I first started eating healthier, canned fish was my saving grace. I mean, I was hesitant about it at first, but once I discovered how easy and satiating it was, I was on board. Of course, fish straight from a can isn’t that great. You have to doctor it up to make it exciting. But typically a tuna salad from a restaurant or store is loaded with mayo made with unhealthy oils and way too much salt for my taste. 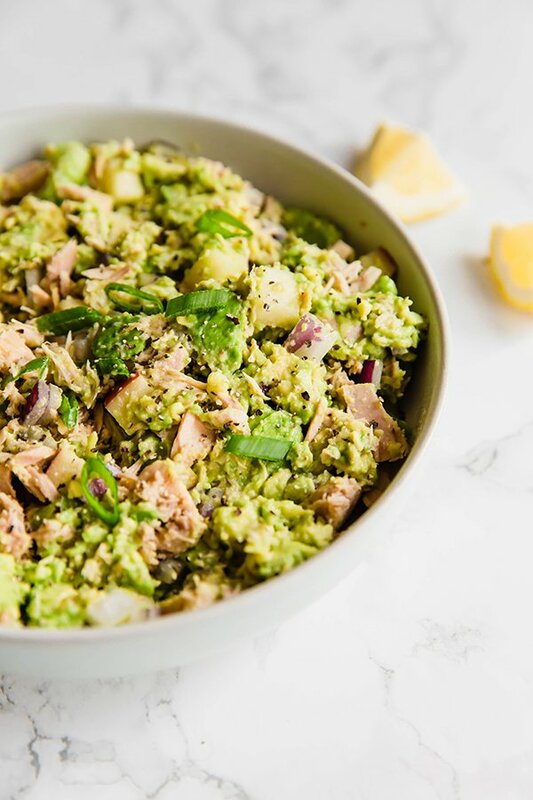 This avocado tuna salad is made with all real food ingredients and takes literally minutes to put together! I love making this tuna salad for a quick lunch on a Saturday when I don’t feel like cooking, but it’s also a great option for packing to bring to work. It’s even easy enough to make in the work kitchen if you bring the chopped components, and it’s something that I did all of the time at my last office job! The canned tuna brand that I like to usee most often is safe catch. It tastes great, and they aim to have lower mercury tuna. Whichever brand you get, be sure it’s one without any added oils or salt so you can more easily control the flavors in the salad. Avocado is basically the mayo substitute in this recipe. I like to use a small-medium avocado for this recipe. Apple gives this tuna salad a touch of sweetness and a bit more crunch. I like to use either a pink lady or Honeycrisp apples. This adds a bit of a spicy element to the recipe. Celery adds more crunch and freshness. Lemon juice adds acid to the dish and helps to keep the avocado and apple from browning. For some more added flavor! Make some sweet potato toast and turn it into a tuna salad sandwich! 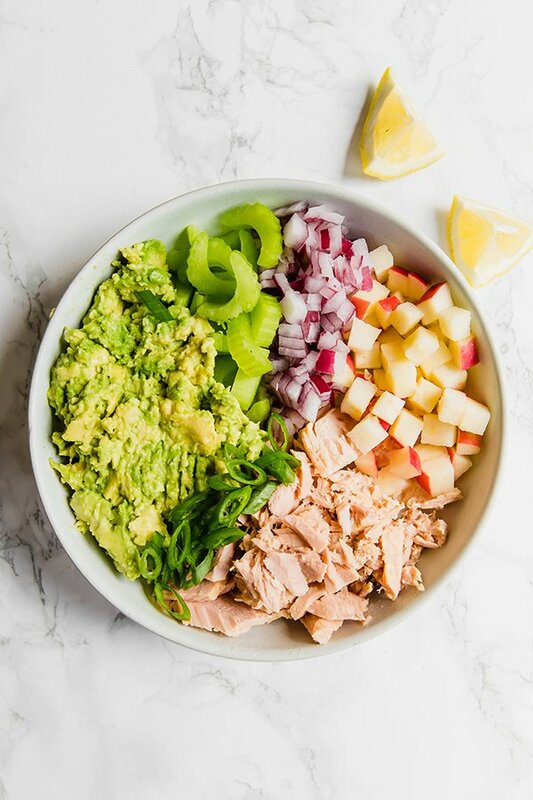 Combine all of the ingredients (reserving the lemon) in a bowl and mix well, using a fork to break up the tuna and mash in the avocado. Top with lemon juice and season further to taste. Add more lemon juice if you plan to store the recipe. Made this tonight! Would be perfect to take to work for lunch or for a picnic lunch! So yummy! I made this for lunch today and it was fantastic!! I liked it so much I went out and bought more Ingredients so I can make it again this week. I subbed canned salmon for tuna. The recipe is very forgiving. I shared a photo of it on my FB page along with your recipe and a couple of my friends have already made it. Thanks for all the great recipes and for blogging! Made this yesterday for lunch. First of all, I’m not a tuna fan but when I wasn’t watching what I ate, I could make a pretty tasty tuna salad sandwich and actually enjoyed it. This was pretty good and though it’s not my favorite, I can eat it again. I also have mercury toxicity which I am working on and haven’t had any tuna for some time. The tuna I have is wild caught and is highly rated so hopefully that won’t derail my detoxing. If you love tuna, you will love this. I’m just don’t love tuna. OMG, this was amazingly delicious! I chopped everything up and added chopped arugula. This may end up being a weekly thing! Thank you so much, Denise!! So happy you like it!